‘You couldn’t make it up’, said police. A motorist who called police to report another driver was drunk following an accident “forgot” he was also over the limit when officers arrived, police said. Derbyshire Police said “you couldn’t make this up” following the incident at junction 25 of the M1 between Derby and Nottingham. The force’s road policing unit said there was a minor bump between two cars and one driver suspected the other was drunk so rang police. But he forgot he was also drunk, which officers spotted when they went to investigate. Both drivers were arrested on suspicion of drink-driving and have been charged. “One driver suspects the other is drunk so quite rightly calls us. Forgetting he is also drunk. The breath test limit is 35 microgrammes of alcohol per 100 millilitres of breath. Derbyshire Police said the incident happened on the A52 roundabout, beneath the M1, at 5.30pm on Sunday. 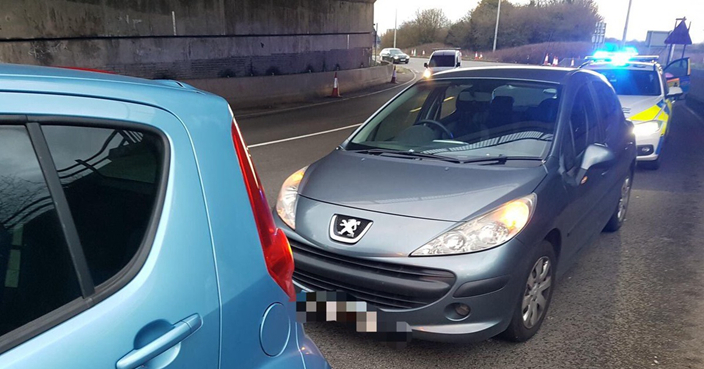 The collision involved a Peugeot 207 and a Vauxhall Agila. It led to a 60-year-old from Nottingham and a 46-year-old from Draycott, Derbyshire, being charged with drink driving.